This Standard Radio System Plan 504 (SRSP-504) replaces the Telecommunications Regulation Circular 73 (TRC-73). 1.1 This Standard Radio System Plan (SRSP) states the technical requirements for Canadian local, regional, and nationwide radio-paging systems operating in the band 929-932 MHz. 1.2 This SRSP also describes the interim sharing arrangements for the usage of this band between Canada and the U.S. in the border area (hereafter referred to as the coordination zone). 1.3 This SRSP is intended to be employed in the design and specification of radio paging systems. It specifies equipment characteristics relating to efficient spectrum usage only and is not to be regarded as a comprehensive specification for equipment design and/or selection. 2.2 Radio paging systems conforming to the requirements contained in this SRSP and the policy document RP-011 will be given priority in licensing over non-standard systems. 2.3 The arrangements for non-standard systems are outlined in SP-GEN, General Information Related to Spectrum Utilization and Radio System Policies . 2.4 Although a radio system conforms with the requirements of this SRSP, modifications may be required to the system whenever harmful interferenceFootnote 1 is caused to other radio stations or systems. 2.5 The band 929-932 MHz, which has been sub-allocated for radio paging operations, is subdivided into 3 one megahertz wide sub-bands. The current use of the sub-bands 929-930 MHz and 931-932 MHz is outlined in section 4 of Radio Systems Policy RP-011. The sub-band 930-931 MHz has been identified for narrowband PCS and the current use of this sub-band is outlined in SRSP-509. 2.6 The channel spacing for the sub-bands currently available for use is 25 kHz. 2.7 Sharing of radio-paging channels by more than one user may be required when channel loading requirements are not met (see section 7 and Annex 1 for more details). Individual paging systems up to a maximum of three could be required to share a paging frequency in order to achieve full loading capacity of the channel. 3.1.1 Radio Systems Policy 011 (RP-011) - Radio Systems Policy for Radio Paging With Special Reference to the 900 MHz Band. 3.1.2 Spectrum Utilization Policy GEN (SP-GEN) - General Information Related to Spectrum Utilization and Radio Systems Policies. 3.1.3 Spectrum Utilization Policy 896 (SP-896) - Spectrum Utilization Policy for the Fixed, Mobile, Radiolocation and Amateur Services in the Band 896 to 960 MHz. 3.1.4 Radio Standards Specification 119 (RSS-119) - Land Mobile and Fixed Radio Transmitters and Receivers, 27.41 to 960 MHz. 3.1.5 Radio Standards Procedure 101 (RSP-101) - Application Procedure for Planned Radio Stations Operating on Frequencies Below 960 MHz. 3.1.6 Telecommunications Regulation Circular 43 (TRC-43) - Notes Regarding Designation of Emission (Including Necessary Bandwidth and Classification), Class of Station and Nature of Service. 3.1.7 Client Procedures Circular 2-0-02 (CPC-2-0-02) - Antenna Structure Clearance. 3.1.8 Client Procedures Circular 2-0-03 (CPC-2-0-03) - Environmental Process, Radiofrequency Fields and Land-Use Consultation. 4.1 In major urban areas (see Annex 2, section 1.1) and any other areas determined by a Regional or District office of the Department where there is, or there is forecast to be, intensive radio-paging use of the 929-932 MHz band, the ERP and antenna height for base stations will be limited to a maximum of 316 watts (25 dBW) and 180 metres above average terrain (AAT) respectively. The height of transmitting antenna above average terrain (AAT) is the height of the antenna structure plus the height of any building on which the structure may be mounted. 4.2 In other areas of moderate radio-paging use (see Annex 2, section 1.2), the ERP may be up to a maximum of 500 watts (27 dBW). 4.3 A reduction in ERP from those specified in paragraphs 4.1 and 4.2 are required for base station antenna heights in excess of 180 metres above average terrain (AAT) as described below in Table 1. 4.4.1 Technical factors including transmitter power, antenna height and gain, and terrain will affect co-channel reuse distances. Based on an ERP of 500 watts, an antenna height of 180 metres and a receiver power of -104 dBW and using the free space formula, the interference free co-channel reuse distance at 930 MHz is 91 km. However, the actual co-channel reuse distance required may vary depending on local topography. 4.4.2 A detailed interference study, at specific locations, of co-channel, fixed service assignments in the band 929-932 MHz may be required to determine potential interference situations. The status of the fixed systems in this band is defined in the Radio Policy 011 (RP-011), section 6.1. Paging systems may be authorized in the bands 929-930 MHz and 931-932 MHz with higher ERP on a non-standard basis as suggested in the details set forth in Annex 3. 5.1 The interim Canada/U.S. 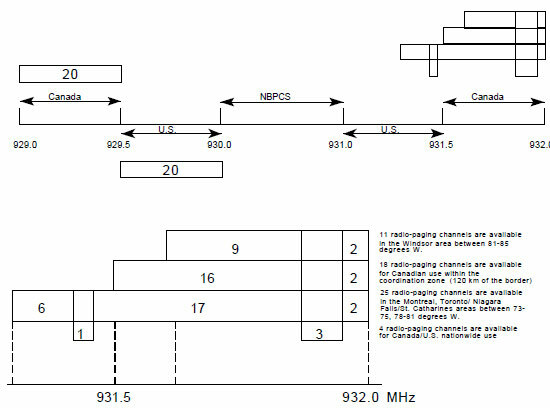 coordination considerations that are based on the principle of cross-border equitable sharing of the band 929-932 MHz for paging operations within 120 km of the Canada/United States border (hereafter referred to as the coordination zone) are illustrated in Figure 1. This principle also includes discussions concerning reassignment of existing fixed stations, when necessary, in order that equitable sharing may be achieved. 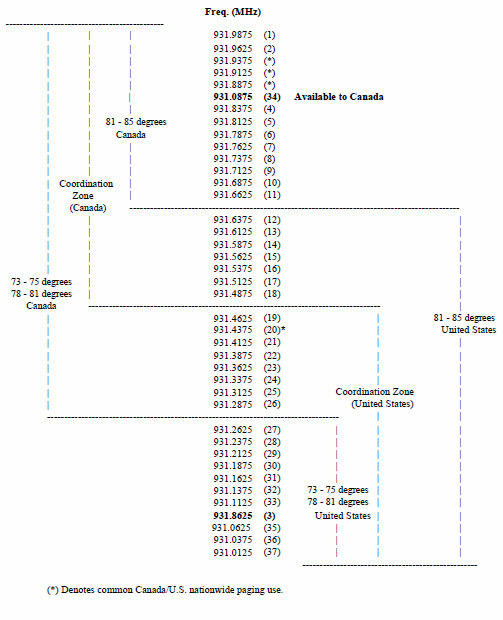 5.2 Coordination between Canada and the United States for paging operations within the coordination zone is not required, provided each country uses the frequency bands respectively allotted as shown in Figure 1 and described below in section 5.3. Within the coordination zone (120 km of the border), Canada shall have exclusive use of the frequencies in the band 929.0-929.5 MHz (20 channels). This sub-band has been identified for narrowband PCS. The plan is set forth in SRSP-509. 5.3.3.1 Four (4) paging channels have been designated as Canada/US common nationwide channels (see section 6.1.2 of this SRSP and section 4.1 of RP-011). Coordination of transmitter installations within the coordination zone on these (nationwide) channels is required to eliminate harmful interference and to ensure continuance of equal access by both countries, including the use of time-sharing or other techniques. Coordination of these frequencies shall be carried out by the licence applicants. Industry Canada shall be notified of any arrangements agreed to by the licence holders. 5.3.3.2 The sharing arrangement for the remaining 36 channels is outlined below and in Table 2. Between 73 -75 degrees W. longitude (including Montreal), a total of 25 frequencies are available (Table 2, channels 1, 2, 4-19, 21-26 & 34). Between 78 - 81 degrees W. longitude (including Toronto, St. Catharines and Niagara Falls), a total of 25 frequencies are available (Table 2, channels 1, 2, 4-19, 21-26 & 34). Between 81 - 85 degrees W. longitude (including Windsor), a total of 11 channels are available (Table 2, channels 1, 2, 4-11 & 34). 6.1 The frequency plan for local, regional and nationwide radio paging operations in the band 929-932 MHz is outlined below. Table 2 further outlines the frequency plan for the band 931-932 MHz. 6.1.1 The upper sub-band 931-932 MHz will be assigned first for paging operations. Authorizations in the sub-band 929-930 MHz will be made only if no channels are assignable in the band 931-932 MHz, and taking into consideration usage of the adjacent band 928-929 MHz for fixed links. The radio-paging channels in the upper sub-band will be assigned commencing at the upper end and working downward. Within the coordination zone, with the exception of the Montreal, Toronto and Windsor areas, located between 73 to 75 degrees W., 78 to 81 degrees W. and 81 to 85 degrees W. respectively, 18 radio-paging channels are available for Canadian use for local and regional radio-paging assignments if located within the coordination zone (see Table 2). In the Montreal/Toronto and Windsor areas 25 and 11 channels will be designated for radio-paging use, respectively (see Table 2). Within the coordination zone, the frequency 931.0875 MHz is available for exclusive Canadian use and the frequency 931.8625 MHz is available for exclusive U.S. radio-paging use (see Table 2). Four (4) radio-paging channels, 931.4375 MHz, 931.8875 MHz, 931.9125 MHz and 931.9375 MHz, are available for Canadian/U.S. common nationwide use. Additional radio-paging channels will also be made available "on demand" for exclusive Canadian nationwide paging service. Digital or tone only paging will be preferred as described in the Radio Policy 011 (RP-011), section 3.2. More than one signalling format may be permitted on local and/or regional radio paging frequencies. Initially, frequency sharing is not be required for local or regional radio-paging systems. In the event that a given radio-paging system is not growing at predicted rates, the Department would consider the addition of other licensees on a frequency-shared basis in an effort to maximize the spectrum utilization. The number of users on the same frequency, within the same area should not exceed three. Transmissions should not normally be repeated more than twice per page (see Annex 1 for example details). Each hour of operation will be subdivided into a number of fixed slots, by at least 20 seconds to one minute time slotting, to be used by operators in a systematic way thus ensuring acceptable delays (see Annex 1 for example details). Monitoring at specific locations, or other forms of channel usage assessment, would be used by the Department to determine if the channel is fully utilized or whether additional users may be added to ensure that the spectrum is used efficiently. In the band 929-932 MHz (see section 6 for more details) radio-paging channels for nationwide use will be assigned one at a time to users taking into consideration the loading on these channels. Additional users will then be added on a shared basis to ensure that the spectrum is used efficiently. For Canada/U.S. common nationwide radio paging operations, a compatible signalling and transmission code will be required on the frequency to ensure the availability of service to the roamers. The detailed coordination for the equitable use of these frequencies is to be carried out by the Canadian and U.S. license applicants. The Canadian applicant shall also provide Industry Canada, when requested, the details of the arrangements agreed to by both license applicants. One signalling format on exclusive Canadian nationwide radio paging frequencies is encouraged. However, more than one signalling format may be permitted. Voice paging transmission will be permitted as a secondary priority service offering on the exclusive Canadian nationwide frequencies, provided that the channel utilization for voice paging is such that no more than 10 percent of nationwide pages are delayed by more than two minutes. Preference will be given to systems using transmission and coding techniques which maximize the number of subscribers on a given frequency. After the first year of radio paging operation, licensees should demonstrate to the Department actual channel loading with "on-the-air" occupancy statistics. Technically speaking, the paging channel can be shared within the same geographical area by more than one operator provided that a means of transmission monitoring is maintained between the various operators. To facilitate sharing, each hour of operation is subdivided into 60 slots. Each slot is comprised of 60 seconds. As an example, Tables 1a and 1b provide available capacity for RPC1 and GSC codesFootnote 3, in number of users/hour/per operator as a function of the number of operators per channel based on a loading of 0.18 call per user in the busy hour. (*) (Repeat ) two transmissions per paging. (**) (Repeat) three transmissions per paging. Note: The unit K in Tables 1a and 1b represents 1000. *** Tone only, Batch mode: 16 address. **** Tone only, Extended batch mode: 32 address. (i) (Repeat) two transmissions per paging. (ii) (Repeat) three transmissions per paging. 12 St. Catharines/Niagara Falls, Ont. 1.1 Authorization for effective radiated power (ERP) in excess of the limits stated in section 4.0 of this SRSP, will be on a non-standard basis. 1.2 In major urban areas as indicated in Annex 2, section 1.1 and any other areas determined by a Regional or District office of the Department where there is, or there is forecast to be, intensive radio-paging use, the ERP and antenna height for base stations will be limited to a maximum of 1600 watts (32 dBW) and 180 metres above average terrain (AAT) respectively. The height of the transmitting antenna above average terrain (AAT) is the height of the antenna structure plus the height of any building on which the structure may be mounted. 1.3 In other areas of moderate radio-paging use, as indicated in Annex 2, section 1.2, or any location outside those defined in paragraph 1.2 of this Annex, the ERP may be up to a maximum of 2500 watts (34 dBW). 1.4 A reduction in ERP from that specified in paragraphs 1.2 and 1.3 of this Annex is required for base station antenna heights in excess of 180 metres above average terrain (AAT) as described in Table 1 of this SRSP. Notwithstanding the above, the ERP levels as specified in paragraphs 1.2 and 1.3 of this Annex may be maintained for the antenna main lobe provided that the ERP on the horizon is reduced by the value given in Table 1. This can be accomplished by such means as beam tilting. 1.5 The maximum transmitter power is 250 watts. 1.6 Application of the limits outlined in this Annex will be on a case-by-case basis, with full justification required in accordance with RSP-101, Parts I, II and III. A requirement for data rates in excess of those normally used, with supporting rationale, could constitute a partial justification. Regardless, the ERP shall be limited to that which is necessary to provide the required service as governed by the system requirements. 1.7 In evaluating proposals for operation of ERP levels in excess of those given in section 4 of this SRSP, Regions will take into account operations in adjacent frequency bands. 1.8 The co-channel reuse distance is preserved as 91 km. However, a greater separation of actual co-channel reuse distance may be required depending on a particular system design, local topography, such as the use of mountain top sites or sites separated by bodies of water. 1.9 If more power is requested in order to cover a spot inside the main coverage area which is not adequately covered, the applicant will have to justify why a zone enhancement system is not used. 1.10 For simulcast systems, the applicant will have to provide performance criteria including the transmitter's frequency stability as well as the maximum phase error between the various transmitters that the applicant considers acceptable. 1.11 The applicant may be asked to participate in the licence issuance process in terms of finding solutions to interference problems that may be revealed by our EMC analysis. 1.12 The applicant will be responsible for resolving any interference caused to radiocommunication systems when the power is in excess of that specified in section 4 of this SRSP. In cases where no solutions can be found, the applicant will have to reduce his power accordingly. 1.13 Industry Canada may request that practical tests be carried out to demonstrate the need for higher power. Return to footnote reference 1 For the purpose of this SRSP, harmful interference means interference which endangers the functioning of a radionavigation service or of other safety services, or seriously degrades, obstructs, or repeatedly interrupts a radiocommunication service operating in accordance with regulations and technical requirements laid down by Industry Canada under the Radiocommunication Act . Return to footnote reference 2 The TRAA includes all special coordination procedures and exchange of letters required for the use of various frequencies for paging operations. Return to footnote reference 3 RPC1 refers to the CCIR Radio-Paging code No. 1 (CCIR Rec. 584), and GSC refers to Golay Sequential Code (CCIR Rep. 900, Annex 1). This figure shows the frequency bands allotted to Canada and the United States for paging operations. Within the coordination zone (i.e. 120 km from the border), Canada shall have exclusive use of the frequencies in the band 929-929.5 MHz (20 channels) and the United States shall have exclusive use of the frequencies in the band 929.5-930 MHz (20 channels). Except for the two areas defined below, Canada shall also have exclusive use of the frequencies in the band 931.5-932 MHz (18 channels, not including the 3 Canada/U.S. common nationwide channels centred on 931.8875 MHz, 931.9125 MHz and 931.9375 MHz) and the United States shall have exclusive use of the frequencies in the band 931-931.5 MHz (18 channels, not including the Canada/U.S. common nationwide channel centred on 931.4375 MHz). Area 1 is defined to be the portion of the coordination zone in Canada and the United States bounded on the East by 73 degrees West longitude and on the West by 75 degrees West longitude (which includes Montréal); and bounded on the East by 78 degrees West longitude and on the West by 81 degrees West longitude (which includes Toronto, St. Catharines and Niagara Falls). Within Area 1, Canada shall have exclusive use of 25 channels in the band 931.275-932 MHz (please refer to Figure 2 description for specific channels/frequencies). Area 2 is defined to be the portion of the coordination zone in Canada and the United States bounded on the East by 81 degrees West longitude and on the West by 85 degrees West longitude. Within Area 2, Canada shall have exclusive use of 11 channels in the band 931.65-932 MHz (please refer to Figure 2 description for specific channels/frequencies). The sub-band 930-931 MHz has been identified for narrowband PCS. Description: This chart shows the channels/frequencies within the band 931-932 MHz available to Canada and the United States for paging operations. Within the coordination zone (i.e. 120 km from the border), with the exception of areas 1 and 2 described below, the following table lists the channels/frequencies in the band 931-932 MHz that are available for paging in Canada or in the United States. Area 1 is defined to be the portion of the coordination zone in Canada and the United States bounded on the East by 73 degrees West longitude and on the West by 75 degrees West longitude; and bounded on the East by 78 degrees West longitude and on the West by 81 degrees West longitude. Within Area 1, the following table lists the channels/frequencies in the band 931-932 MHz that are available for paging in Canada or in the United States. Area 2 is defined to be the portion of the coordination zone in Canada and the United States bounded on the East by 81 degrees West longitude and on the West by 85 degrees West longitude. Within Area 2, the following table lists the channels/frequencies in the band 931-932 MHz available for paging in Canada or in the United States.